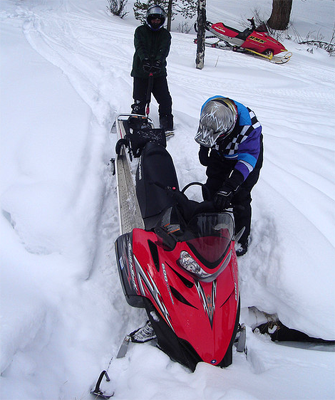 My favorite thing to do in the winter time is snowmobile. Utah in the late fall sees the temperatures start to drop into the freezing range a lot quicker that I would like. But it lets me know it is time to get my sleds out and get them ready for the winter season. It also means it is time to get all of my warm polypropylene gear out of the attic so that I can enjoy being out in frigid winter conditions and still be warm and have a great time. One product that I have been wearing when I snowmobile is a thick pair of 100% polypropylene military weight socks from Burnesville Mills. I’ve always known that 100% polypropylene retains more heat than any other fabric. It also retains your body heat when it is wet. That is the main reason I choose to wear them because it seems like no matter how hard you try to keep snow out of your boots, some always finds a way in and your feet get wet and cold. Ever since I started wearing the polypro socks my feet woes have all but gone away. Well, last winter I had an unexpected chance to really put my 100% polypro military weight socks to the test. My wife and I were out snowmobiling in the Strawberry Reservoir area past Daniels Summit in Utah. We were on the north side of the reservoir where there are several creek beds that wind through the area. We weren’t too concerned about the creek beds because the snow was so deep. You couldn’t really see them for the most part. Well, as luck would have it I was turning around to head back into the middle of a meadow when my track dug in and I got stuck. When I stepped off to assess my situation I sunk into the snow up to my waist. I thought it was pretty funny at first until I could feel my feet getting wet. It quickly hit me that I was in a creek bed and now my snowmobile boots, polypro socks and feet were now soaked. I quickly scrambled out. After tying a rope to my snowmobile and pulling it out, I sat on my seat and took my boots off. By now my feet were starting to get pretty cold. I poured all the water that I could out of my boots. Luckily my boots have a liner too that I was able to pull out and ring most of the water out. I took my 100% polypropylene military weight socks off and rung them out too. With no other options but to wear them, I put everything back on and crossed my fingers that I wouldn’t get frost bite or something. The sun was out and it wasn’t bitterly cold, but the temperature was below freezing. After putting my socks and boots back on, my feet were a little warmer but still cold. I trudged through the snow for 20 yards or so to get the blood flowing and my feet warmed right up. When this incident first happened, I was thinking that our fun was all over and that we would have to quickly get back to our vehicle so that my feet wouldn’t freeze. But, thanks to my thick 100% polypro socks, we were able to ride for the rest of the day without any real problem. My feet did get a little cold on the longer trail rides, but it didn’t take much to get the blood moving again effectively warming my feet back up each time. I’m sure glad technology has made a product like polypropylene available. I know that the U.S. Navy and U.S. Coast Guard are required to wear 100% polypropylene under their cold water suits to keep them alive in cold water. 100% polypropylene is good stuff!